A traditional Kokeshi, with landscape (Notice the farmer and horse). 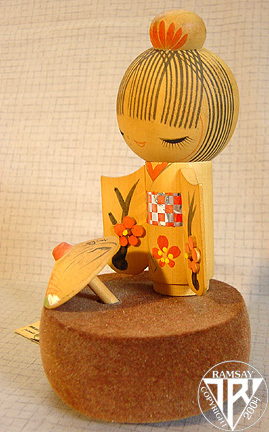 A colorful, modern Kokeshi, with umbrella. 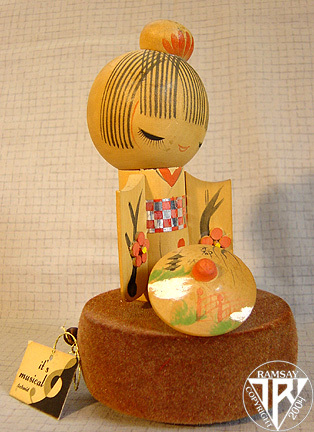 Another modern Kindai Kokeshi, with umbrella. A modern Kokeshi, with long kimono sleeves (Notice the delicate cherry blossoms). A Nesting Kokeshi Doll, with one "child". A Nesting Kokeshi Doll, with two "children". A Nesting Kokeshi Doll, with three "children". 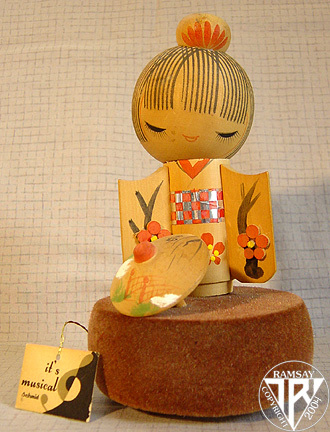 An adorable Kokeshi Music Box by Schmid.